In part one, we covered roasting, sautéing, and grilling. I can hear you asking, “Why cover such basic stuff”? Well, for many of us, this is kindergarten stuff. But I suspect that many waiters, especially beginning ones, have never given cooking methods much though. for those of us who are also foodies, it’s pretty elemental. But even I had to struggle a little to make certain distinctions when trying to define some of the methods. Having said that, we soldier on. Broiling is akin to grilling. You might consider broiling as grilling with the heat coming from the top instead of the bottom. Not only do you cook with direct heat, you add indirect heat to the mix because you’re automatically cooking in an enclosed space. As in your oven, commercial broilers that you find in a steakhouse provide heat from the top and the item to be broiled is placed close to the heat source. Temperatures are higher than roasting, usually above 500°. One of the main advantages of broiling is that you cook it so quickly and at such a hot temperature that the item being broiled doesn’t have a chance to cook in its own steam. This keeps surfaces crisp and non-soggy. sometimes, the broiler is used simply to add additional color and caramelization to other cooking processes such as roasting. While fish isn’t “roasted” too often, it is broiled quite a bit, especially firm and or fatty fish like salmon and swordfish. for some reason, people have tended to either bake fish or broil it – roasting at an in-between temperature only seems to be now becoming more fashionable. You rarely see it in a restaurant. I suspect that the term “roasted” simply doesn’t sound like it belongs with fish. It’s a perfectly fine way to prepare fish – you just don’t see it very often. Speaking of baked – seems like a pretty simple thing – it’s what you do to a cake. Well, basically, it’s the cooking range below roasting. Baking usually occurs at 275° – 400°, whereas roasting occurs above 400°. Baking is a slower process and is used for leavened and unleavened bakery-type products, casseroles, things with melted cheese, etc. Baking cooks through the convection of hot air rather than direct radiated heat. It uses the steam producted by the item getting cooked to help with the cooking. As I pointed out, fish can be baked. Generally you don’t bake meat unless it’s in a stew or some form other than in the primal form. When it comes to fish, baking implies a more delicate texture and moisture than other methods. Braising is the act of using liquid and steam and time to cook an item. In order to get good color, the meat being braised might be seared first in order to bring out additional caramelization. It might be floured first to assist in getting a good outer texture. It’s usually used for tougher cuts of meat like ossobucco, pot roasts, pork shoulders, etc. These cuts are “tough” because they have connective tissues integral to the muscle meat that have to be broken down and this can only be done through long cooking. meat also has collagen, which is released through slow cooking. This adds gelatin to the liquid, which adds a velvety mouthfeel to the braising liquid. Braising uses this very liquid to assist in the cooking and it’s done in a covered vessel which captures steam as well. You might use water, stock, or tomatoes to add to the natural juices of the item being braised. If you are making a stew, then you are braising. Steaming – pretty obvious, eh? It’s the cooking of an item through steamed. This is a popular cooking method in Asian cuisine and it’s becoming more and more popular in modern Western cooking, although “European cuisines have long used steaming in certain quarters of their cooking. Steaming is considered a “healthy” way to cook since you don’t use oil or stock (obviously both can be added to the final product). Steaming can be done directly over “loose steam” or it can be augmented through a pressure cooker, which multiplies the temperature of steam to speed up cooking. We touched on frying briefly in the previous installment. Frying is cooking through hot oil. Deep fat frying means that the item to be fried is completely submerged, while pan frying implies frying in a skillet or sauté pan loaded with an inch or so of oil. Frying is considered the unhealthiest form of cooking, but in some ways, the most “satisfying”. Frying is the only way to get a really perfect french fry. Most items have to be protected through flouring, breading or battering before frying. French fries and other fried potatoes are best prepared by blanching them in hot oil until barely cooked, removed from the oil and then fried a second time. Blanching is a cooking method all of its own. It means cooking quickly to a state called “par cooked”. Par cooked means to cook short of completion. The item is cooked to completion at a later date. Blanching can be done in boiling water as in the case of vegetables which are then plunged into ice or ice water to ‘shock” them, or hot oil in the case of potatoes. Blanching vegetables in water preserves the texture and color of vegetables and can eliminate certain odors present in things like cabbage. Smoking is the application of smoke in a slow cooking environment. Cold smoking is done at very low temperatures, and, as such, has to be done very carefully to avoid food contamination issues. Hot smoking is what’s done in true barbecuing. Basically, you get a grill fire to a fairly constant temperature between 200° – 300° (the pros prefer around 225° – 250°). Wood and other aromatics are added directly to the hot coals, which creates smoke, which infuses the meat with such aromas as hickory, mesquite, applewood, etc. The wood has to be replenished periodically while the meat slowly cooks. Smoke ceases to penetrate the meat any further after about 6 hours or so. You might call it slow roasting. Smoking is generally not done if meat is finished in less than an hour, with the obvious exception of fish. Poaching is cooking completely in liquid, usually at a level below a full boil, usually in the 165° range. The liquid can be water or court bouillon, a traditional French poaching liquid which features aromatic vegetables, herbs and an acid component. Poaching meat keeps the meat moist but fairly bland. We all know poached eggs from eggs benedict.One of the newest trendy way of cooking, popularized by Top Chef, is sous-vide. Sous-vide is French for “under vacuum”. this is a poaching method whereby the item to be cooked is enclosed in a vacuum pack and then cooked in water for an extended period of time. You might say, “Well, my mama used this method when she cooked stuff in bags in boiling water”. A contraire, mon ami, sous-vide is a different process entirely. The food is cooked much longer and in a water bath of much lower temperature. A lot of care has to be taken to prevent food borne illness due to the low temperatures. Sous-vide provides a very sophisticated and nuanced texture to meat. There are also other methods of cooking such as “slow cooking” (crock pots) and “sub-categories” of cooking such as sweating, blackening, coddling, creaming, etc. There are even cooking methods that don’t involve traditional heat such as pickling and marinading. Did you know that a marinade actually cooks food if left on for extended periods? Ceviche is a good example of this “chemical cooking”. So, now that I’ve painted some broad strokes, how does this benefit you as a waiter? Well, first of all, isn’t it cool to know more about the food that you’re serving? But more importantly, the cooking method can help guide you to ways to sell various items. When you can properly describe things as tender, succulent, fall off the bone, toasty, crunchy, savory, you will have greater success matching people with food. The style of cooking can help you in this regard. If something is braised, you’re not going to describe it as you would if it were broiled. As you learn more about cooking styles, you’ll learn more and more accurate descriptors. This is your job, after all. You’re not just an order taker. How many times have you wanted a homemade cake but didn’t want to throw half of it away after a couple of days because you didn’t want to eat the same cake for days on end? Those who have large families usually don’t have to worry about this sort of thing, but for those who don’t have a voracious group of gobblers, this book is a welcome addition to the household. Baking is an exact science, unlike other types of cooking where you can add a little bit of this or subtract a little bit of that. Baking relies on specific chemical reactions between certain ratios of ingredients and temperatures. Too much or too little of an ingredient can cause a catastrophic failure. This book is useful in that the ratios have been maintained during the trimming down process. The author turns regular cakes into cupcakes, frosting into “just enough”, pastry into amounts good enough to make two small pies, etc. And she cleverly uses empty 8 – 16 oz cans for baking small cakes, saved from the trash can after cooking the cream corn that originally came in it. 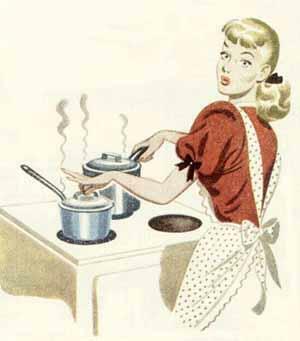 She also advises on choosing things like mixing bowls, because your standard-sized mixing bowl isn’t appropriate for small amounts of dough and batter. One caveat though – there’s a little sloppy editing that allows a crucial mistake in the very first recipe – water is substituted for buttermilk in the ingredients listing even though buttermilk is mentioned in the instructions. This is supposedly fixed in later printings, but mine is the 3rd printing so it hadn’t been corrected up to that point. So, every recipe in the book should be closely looked at before trying it and it might be a good idea to do a trial run before baking something for a special occasion like Valentine’s Day or a spouse’s birthday. Fortunately, if something goes wrong, it’s not like you’re going to be throwing out a lot of raw ingredients. All in all, a clever MacGyveresque book that might prove useful to most people from time to time. After all, wouldn’t it be cool to just make a half cup of peanut brittle so that you aren’t munching on the crack-like substance for days on end? This is the baking-specific companion to Master Chefs, the PBS cooking program hosted by Julia Child. The book itself was written by famed author Dorie Greenspan, with an introduction by Ms. Child and the participation of 22 famed bakers and chefs. The first part of the book is devoted to definitions and techniques that one needs to be a successful baker. The rest of the book features clear step-by-step instructions and tips on specific baked products, from Middle Eastern flatbreads like matzoh and pita to French artisan breads, Finnish crisps, and various desserts. It even includes instructions on making your own three-tiered wedding cake. This book is especially useful in clarifying issues one finds in baking, as well as offering many tips, hints and shortcuts. Each baker brings his or her own expertise along with the recipes that they bring to the table. If you are even remotely interested in baking, whether it’s creating the perfect pie crust, or learning how to make homemade croissants, this is a very worthy volume. Plus, you can never go wrong with Julia Child. Silpat? What in the heck is that? It’s a silcone impregnated plastic baking mat. It starts as woven fiberglass and then it’s coated with a heat-resistant silicone-impregnated plastic. It’s a true time-saver when baking. Nothing sticks to it; not cookies, not melted cheese, not dough, not anything. To clean it, you simply wipe it with a cloth. Occasionally you might feel better about using a little detergent and a good rinse, but it usually doesn’t even need that. It’s great because you don’t have to use any oil on a baking sheet – in fact you don’t use any oil whatsoever. It is good up to 482º so it’s good for any possible baking that you might do. It isn’t usable for roasting or broiling, although you can use it for slow roasting things like tomatoes and you can use it almost as a dehydrator in a very slow oven. You don’t want to put any hot pans on it, nor do you want to ever cut it “to fit”. Fiberglass is hazardous to the health. They also say that you shouldn’t put it in the dishwasher. Just a quick wipe will do. In line with this, don’t use any metal scrapers, knives, cutters or spatulas. You won’t need them anyway. Cookies and baked goods slide right off. All you might need is a little nudge from a plastic spatula. If you have a large enough Silpat, you can use it for rolling out dough. The bottom of the mat is tacky, so it sticks to the countertop. You really don’t have to flour the dough very much to keep it from sticking. You use the mat with the writing side up. It will discolor over time through the oil that’s emitted by things like cookies and cheese (remember, most cookies are mostly butter). But that isn’t a problem. Don’t use it with insulated or air-type baking sheets. Always use it with simple one layer baking sheets. You can use it for reheating pizza but you shouldn’t use it for baking pizza because a baking stone works a lot better and you won’t get a good crust with it (plus, frankly I cook pizza at the highest temperature possible anyway). Personally, I wouldn’t use it for anything that sits in a baking dish because I can just as easily put those on a bare metal baking sheet. You should always use it with a baking sheet and you should always store it flat. Never fold it up. I actually roll mine loosely, which the manufacturer doesn’t recommend, or even comment on, but I suspect that it’s fine, since that’s how it’s packaged from the manufacturer. One thing about baking cookies on this mat – they tend to end up flatter than when you cook on greased metal. The manufacturer says that this is because of the extreme slipperiness of the silicone. The dough moves easier as it heats up. So, you might find that you might not want to use the Silpat for certain types of cookies. Feel free to use a greased metal sheet if the result that you’re looking for requires it. There are other brands and they are probably just as good. But this is the original. It’s been used since the 60s in French kitchens. I don’t dismiss the others by recommending this, but this is the only one that I can recommend, since it’s the only one that I use. There are some people who have concerns about using the product as things have come out recently about heating plastics (especially in baby bottles). I have no such concerns about this product, but if you do, then only you can decide whether you want to take the “risk”. There are also some people that claim that they can smell a rubber-like smell, but I’ve never really noticed anything like that. I find the Silpat quite useful because, I’m basically a lazy git. Plus, I like innovative “gadgets”. Guess I’m a sucker for them. This companion piece to Keller’s book The French Laundry Cookbook is even more beautiful than its predecessor. Using luminous silver-halide-esque black and white photos to supplement the nice narrow focal plane color photography of the first volume (this technique leaves only portion of the shot in focus and can leave both the foreground and the background out of focus for artistic effect), the look and feel of the book emphasizes the old world heritage of le bistro. Some of the shots beg to be hung in a tony art gallery. Named for a style of French bistro in Lyon, Bouchon the restaurant creates a paradoxical theme of an upscale bistro. Bouchon the cookbook attempts to convey the mindset behind creating bistro cuisine without reducing it to a French version of a meat-and-three. As in The French Laundry Cookbook, Keller demands an attention to detail and outlines a lot of technical skills necessary to produce a quality product. From his observation that you must discard any “irregular” pomme frites before cooking because they won’t cook evenly (and there’s a photo of the fries in the traditional European paper cone nestled in a hammered metal stand), to his avoidance of the cliché (outlining several skate dishes without talking about the traditional bistro dish of skate and mashed potatoes – instead he does skate with Lyonnaise potatoes), you’ll find dishes as simple as glazed pearl onions (oignons grelots glacés) and as complicated as pork trotters (pork feet) with máche and sauce gribiche (pieds de cochon et máche, sauce gribiche). The principles that bind two restaurants as diverse as The French Laundry Cookbook and Bouchon are an emphasis on fresh and local ingredients, an attention to detail and a passion for and a knowledge of the style of cuisine that’s being attempted. Owning both of these books will move you into a new dimension of cooking, and it’s a great yin to Anthony Bourdain’s Les Halles Cookbook’s yang. You should own both, which you know if you’ve followed my previous cookbook highlights. Before I post the pictures and info, a preamble. Yes, there are a total of 6 (SIX, count’em, SIX) books in today’s post. When I started highlighing cookbooks in my collection, the intention was to do something with cuisine around the first of every month, including a cookbook. Well, since about the middle of last month, it’s been almost daily that I’ve highlighted a cookbook. I’m not guaranteeing that I can keep up the pace, but it’s apparent that cookbooks are going to be featured regularly, if not almost daily here. So, I thought to myself, “Why not do something a little more than usual on the first of every month”? I’m going to forgo the usual titling and let you rely on Google to find the ISBN numbers, etc. He is probably the most important writer on the subject of bread and associated products on the scene. A former Brother in the Christ the Savior Church, he now writes, teaches, and lectures around the country on the subject of baking bread. I think that the first picture at the top is for the paperback. The hardback isn’t that much more expensive and it’s a much nicer package. Spring for the hardcover. In that book, you could see the kernels (pun intended) of future explorations. The second book, Crust and Crumb is less essential in that it covers a lot of the same territory as The Bread Baker’s Apprentice. It was actually the first book where he explored the retarded fermentation and the Apprentice book is its elaboration (written a couple of years later. If you were to choose between the two books, I’d choose the latter. But Crust and Crumb is still worthy on its own. I have both. In 2003, he went on a search to find the best pizza, which was a long-standing passion of his. The book American Pie continues his philosophical and scientific approach to baking, and he outlines a most interesting journey in his search for the perfect crust, a goal which he finds is really an impossibility. He also finds that the overnight, refrigerated fermentation is beneficial for certain pizza crusts, and he also outlines the various styles of pizza found in America and Italy. His Whole Grain Breads tackles the art of baking whole grain breads, the denseness, different hydration requirements and dough manipulation of those grains and flours requiring a different skill set. This is definitely a book for those who eschew highly processed flours. Fi9nally, Sacramental Magic in a Small-Town Café is the book that immediately followed the Brother Juniper book. It is mostly stories and ruminations on the art of baking and cooking, the value of food in our lives and is scattered with varied recipes. Depending on how you look at it, it’s either the most optional or the most essential of his books, as it’s a “Tao of cooking” sort of book. This is a stock photo of my Kitchenaid Professional 600 stand mixer in nickel pearl. A marvelous chunk of modern/retro design. Looks like it could have been chiseled out of a single block of nickel. I truly love this mixer. I do a lot of baking and the 6 qt. capacity and heavy duty motor gives me all of the dough mixing capability that I’ll ever “kneed” (sorry, couldn’t resist). When I’m asked to recommend a stand mixer, I always go with Kitchenaid, and if the questioner mentions baking bread, I always recommend the “6” series (the 6 indicates 6 quarts, the model line you need to safely make heavy bread doughs). There are many Kitchenaid mixers that have been handed down from grandmother to mother to daughter and still work perfectly well. Of course, this was in the days when it was made by the Hobart Co. and there are serious doubts as to the longevity of the current manufacture of the mixers, but mine has operated flawlessly and I continue to recommend the entire line. Before this one, I had a modest white 5 qt. model that I got around ’91 at discount at J.C. Penny (I think I paid $89 brand new). I used it for almost15 years before consigning it to an ex’s kitchen and getting this one 3 years ago.